NEW YORK–(BUSINESS WIRE)–Hang on to your stovepipe hat! MCR, the sixth-largest hotel owner-operator in the United States, has acquired the 116-room Hampton Inn & Suites Chicago/Waukegan. The new Hampton by Hilton hotel is less than an hour from Chicago O’Hare International Airport and within five miles of the Naval Station Great Lakes — the U.S. Navy’s largest training facility and the site of its only boot camp. Celebrating a sailor at one of the base’s weekly graduations? 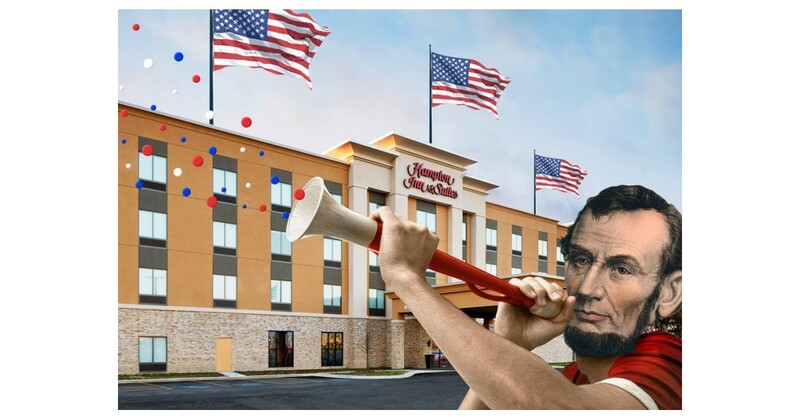 Set up your home base at the Hampton Inn & Suites Chicago/Waukegan and dive into American history while in town. Just in time for Presidents’ Day, you can follow in the footsteps of Abraham Lincoln, whose 1860 visit to Waukegan still has locals talking. “This city has Lincoln stories to tell, so fans should make a stop here,” says Ty Rohrer, Manager of Cultural Arts for the Waukegan Park District. Honest Abe had a memorable stay in Waukegan. He arrived to give a speech on April 2, 1860, a month before nabbing the presidential nomination. But as the great orator spoke to a rapt crowd, the fire bell clanged — flames had erupted at a nearby warehouse. Lincoln rushed to help battle the blaze, asking his audience of 1,500 to join him. “Amazingly, everyone left Lincoln’s speech to go to the Waukegan Harbor on Lake Michigan and watch an old warehouse burn down,” says Rohrer. Local lore has it that the future 16th president took home an unwelcome souvenir: his black wool coat shrank after water splashed on it during the firefighting efforts. Relive that infamous night at the Waukegan History Museum, which holds the sleigh bed where Lincoln got shuteye during his visit. (Fun fact: He never actually slept in the White House’s so-called Lincoln Bedroom!) Then tour the area’s Civil War-era Victorians, snap a selfie with Abe’s bronze bust at the Lake County Courthouse and catch a free exhibit (open through February 26) about his life at the Jack Benny Center for the Arts. After that, motorcade back to the hotel where modern conveniences — a heated indoor pool, free fast Wi-Fi and a 24-hour fitness center — await. Abe would be jealous! Reserve rooms by phone at (847) 473-6600 or online at hamptoninn.com. MCR is the sixth-largest hotel owner-operator in the country and has invested in and developed 104 hotel properties with more than 12,000 rooms in 27 states. MCR’s hotels are operated under 11 brands. The firm has offices in New York City and Dallas. MCR is a recipient of the Marriott Partnership Circle Award, the highest honor Marriott presents to its owner and franchise partners, as well as the Hilton 2017 Top Performer Award. For more information, please visit mcrinvestors.com. The MCR Hospitality Fund LP targets investments in institutional-quality Marriott and Hilton select service and extended stay hotels throughout the country. The fund provides MCR with approximately $1 billion in buying power.